Escape Route Flix, Jean Jacques Dufour, Martin Schliessmann, Why Sturgis? The interview was conducted at Indy’s Capitol Grille at the Conrad Hotel. A Swiss pioneer, a bevy of Indiana wineries, viticulture authorities, and a vino-stained scribe or two are coming together in Martin Schliessmann’s IN(diana) Vino Veritas. 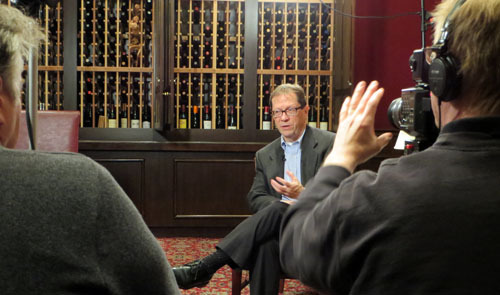 The project is a “documentary on American Wine – with a Hoosier Vintage” is the way Schliessmann’s describes it on the film’s website. I met Schliessman, after a couple months of correspondance, in Indianapolis Sunday and was interviewed for nearly 90 minutes on a variety of wine-related topics. He has already visited nearly 20 Indiana wineries and plans on hitting a few more. He’s talked to all sorts of Indiana folk in and near the wine industry. He is trying to arrange interviews with Purdue University’s viticulture experts. Schliessman is also planning to hire actors to re-enact some of Jean Jacques Dufour’s early days in the 1800s in southeastern Indiana – Switzerland County to be exact. Schliessman is no novice. His Escape Route Flix production company had some success with Why Sturgis? That documentary focused not just on the history of the famous annual motorcycle rally but also on the history of the town of Sturgis. The filmmaker is hopeful to wrap up production on the wine documentary this summer and have rough cuts ready by fall. He sees Public Television as the most likely outlet along with festivals and other special wine-related events. He’ll also have it on a DVD for sale. It was a great experience and I really enjoyed adding the ‘wine journalist’ point of view in response to Marty’s questions. I’ll have more on the film throughout the year.